Best brisket I've ever made, and I've made a few. 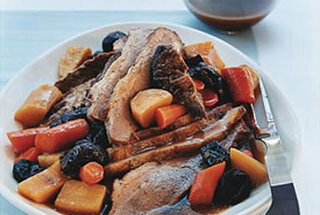 The brisket is good for the same reason brisket is always good: it's slow cooked in a large oven-safe dish with vegetables and fruit (in this case tzimmes). If you do it right, it should literally melt in your mouth. Just one tip: cut way back on the prunes. They make you poop. The flavor is fantastic, but the tzimmes will survive with a fraction of what the recipe calls for. Tzimmes allows for other dried fruit, like raisins or even dried apple slices. Hmm, I'm already getting ideas for the next one . . .